Is Young Fatherhood Causally Related To Midlife Mortality? Wee P-values Say Yes! Table 1 from the paper. What is it with these academic attacks on marriage? Last week having a kid was said to be worse than death. “Having A Kid Worse Than Divorce Or Death? Wee P-values Say Yes.” Yesterday another academic asked, “Two thirds of married people admit to or desire an affair. Is it time to rethink sexual morality?” She says yes. (At least she didn’t abuse any p-values.) And everything about this making-the-rounds “Tinder-hookup culture” article is depressing. What is striking in today’s academic foray is the word “causally” in the title. Wee p-values are being used to claim a causal relationship, which is exactly the wrong thing to do (video). It might be true that having kids young kills men, but proving it via wee p-values cannot be done. It also sounds preposterous to claim that young men fathering children kills those men. That’s, after all, what “mortality” means. Kills. Rubs out. Knocks on the head. Sends to the Great Beyond. Being “at risk” for mortality because of having kids early means that the act of fathering is somehow killing some men. Now this study looked at a sample of Finns. The authors followed men from age 45 to death or age 54, at which time they were “censored” (in the usual statistical way). All-cause mortality or censoring was the end point. That’s a common approach, but it’s a silly one. Bus runs over a man, which is a cause of death (no p-value needed to confirm). If that man fathered a child young, in this database it was counted against him as a death not being caused by the bus but because he was a young father. In order for this to be true, it has to be that this young father walked (or was pushed? or slipped? it’s Finland, after all) in the bus’s path because he had a kid before gray hair set in. That sound plausible? No. It doesn’t sound impossible, of course. But it is implausible. Especially when you consider the same thing can and must be said for every other “mode” of death. And listen, since it is obvious that the authors are wrong and that young fatherhood in and of itself isn’t killing men, we’re not after direct causes, but causes of the cause of the death. A cause of the cause of death in the bus example is that a young father was forced to take a bus to work because he was a young father. How could this happen? Well, I don’t know, but that is, of course, no proof that it cannot. 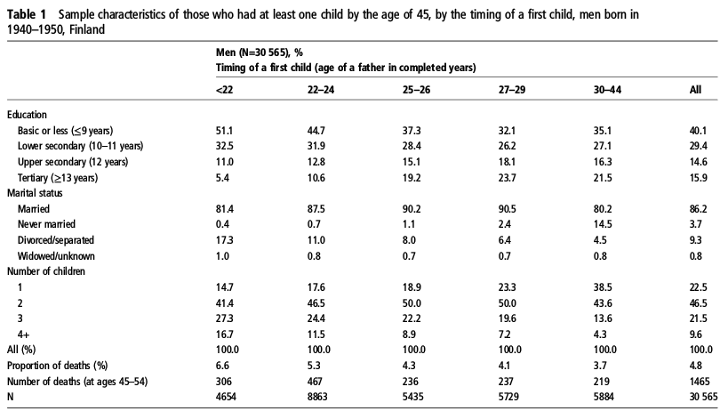 Here’s the conclusion: “Men who had their first child before the age of 22 or at ages 22–24 had higher mortality as compared with their brothers who had their first child at the median or mean age of 25–26.” Smells like an arbitrary cut-off, no? Like maybe, just perhaps—I make no accusation—that ages were played with until a wee p-value from the model came forth. But this is ungenerous. Nobody really hunts for wee p-values, right? The real story is in their Table 1, which is reproduced at the top of this post. More (but not all) fathers under 22 had only “basic” education, more were unmarried, more were divorced than older fathers. This suggests it’s not so much fatherhood which killed the 6.6% of the young men, but other activities. What might these be? We have no idea, at least, no idea from this data set. For, you (don’t) see, the authors never examined the stated or measured cause of death in any case. They should have—but that’s too much work! This is a very important point, which we must repeat. Something caused each young and each old father to die (of those who died, naturally). If we say it is young fatherhood that is killing some young men, then it must be something else that killed the old fathers. What was that or what were those causes? Why and how did they differ? The problem with classical statistical analysis is that it substitutes formulaic manipulation for hard work and hard thinking. And it’s a lousy substitute. What is needed is (A) proper understanding that statistics can’t prove cause, and more importantly than anything else (B) a new (old)—dare we say a third?—way of doing analyses. Thanks to KA Rogers for alerting us to this article. Well, my first was born when I was 23. I am in my 50s now and my children are married. I have friends and colleagues near my age now who have young children under the age of 10. Now, my wife & I can take off when we like; we have a house to ourselves; and are young enough and in good enough health where we can enjoy some things. Would I go back and change anything? Only my career. Would I change my family or when I had kids? Not on your life! It also sounds preposterous to claim that young men fathering children kills those men. That’s, after all, what “morality” means. Kills. Morality? or Mortality? Sly, your enemies. NO – Not an arbitrary cut-off — much demographic data uses a cut-off between 24 yrs and 25 yrs (e.g. http://www.census.gov/prod/cen2010/briefs/c2010br-03.pdf ). There’s probably some reason (maybe even a good one) for why that was done by whoever set the trend…which, like standards & govt regulations, tend to take on a life/inertia of their own. It’s arbitrary. That it is customary makes it worse. If there is anything to the authors’ thesis, there surely must be a “dose-response”, meaning as men are ever younger, the death rates would be expected to increase. And if there is no dose-response, then the authors owe us an explanation why not (which, as I think is now clear, they cannot do). There is thus no a priori reason to use *any* cut offs. And read that passage more closely. It is not just cut offs, but sometimes medians are used, sometimes means. It’s screwy. My first inclination were I to stumble on the correlation at the core of this study would be to look for indicators of risk-taking. Do these young fathers engage in behaviors likely to cause an early death such as drug-use, motorcycle racing, the biathalon (Finnland, guns, avalanche-prone terrains)? “In a subsidiary sample of 1124 siblings, brothers who had become dads by the age of 22 were 73% more likely to die early than their siblings who had fathered their first child at the age of 25 or 26. Similarly, those who entered parenthood at 22-24 were 63% more likely to die in mid life. “These findings were held true, irrespective of year of birth, shared early life circumstances, educational attainment, marital status, region of residence, and number of children. A more obvious possibility — flaw –missed entirely it seems– is a presumption that siblings have in fact similar behavioral traits & experiences. That seems strongly presumptive per the way the study is described. Anybody who’s had a sibling, or even observed them in the wild, knows this is false. Siblings commonly have radically different temperaments. The study appears to have presumed little clones except for one behavior outcome, the child. A clue for that was the reported observation that guys in the short-life sub-category died of hypertension and alcohol-related issues — both associated with life-style behaviors (or, in the case of hypertension, a non-behavior in the form of non-regular exercise and/or poor quality diet). It’s not the kid-too-early that’s the fatal causal factor, its’ the parent’s personal behavior/lifestyle that leads to a kid early on that’s fatal; having a kid early is a easily observed indicator of something(s) else that’s a key contributing factor(s) to early death. This seems so obvious I’d be interested in the background of the researchers — what preconceived conclusion were they aiming for, and why? I wonder what other “risk factors” are associated with young fatherhood? Hmm… Hmmmm…..
Ken: I agree with you on the very likely other factors that contributed (perhaps) to early death. What is somewhat problematic with the ages is why do the ages 25-26 have such a change over the 22-24? What in that one year’s time (24 to 25) changes the outcomes by 63 and 73 percent? It seems rather questionable that going from 24 to 25 before reproducing will extend your lifespan. I can’t see the difference in such a small age range. By age 22-24 people who go on to college from right high school have typically graduated, perhaps with internships and/or after having worked to pay for tuition. That takes some discipline & self-sacrifice in making trade-offs. By 25-26 they’ll typically have some real-world work experience, and if they went to college, a career path that motivates. Such people commonly include a fitness plan in their lifestyle routines & some degree of healthful diet is implicitly understood across most of this demographic. 18-24 would encompass the “Party Animal” phase of immaturity, that, without some sense of purpose & opportunity, sets one up for menial labor, lower income, and a much harder life, generally, with much fewer prospects to look forward to once on that path. Such people commonly have an after-work hangout that includes alcohol, sometimes daily, rather than time at the gym. Typically, intellectual development stagnates with this group. That’s my guess for why the 24/25 yr demarcation is used — it’s a generally representative separation between those that get educated & set themselves up to pursue a cushy white collar lifestyle with perks & peers that admire & encourage growth & development, vs., those that end up on a more subsistence hand-to-mouth sort of hardship lifestyle where their peers overtly & subtly discourage personal development & growth (misery does love company). A bit of bad luck, or poor decision-making and/or irresponsible behavior in the youthful [immature] phase can & does determine which path the rest of one’s life will, or will not, take. In the left-wing liberal mindset, personal decisions/actions that have an adverse effect are never, ever, one’s own fault…so with such a mindset [presumably] the authors of the study can only see things their particularly warped way…leading to the inevitable conclusion that it’s the child’s fault dad died young (not dad’s reckless behavior in knocking up his girlfriend, forcing him to give up college, & the career that would enable, for a menial job to cover immediate bills…which led to a harder lifestyle with like-minded peers who in so many ways encourage persistent immaturity…). That’s my guess at what underlies that study & the significance of the 24/25 year demographic split. Read “The Liberal Mind…” for much more insight into that mentality (www.libertymind.com). After all this time there are those who still think an association found in a single data set (whether or not it’s measured by a p-value) is meaningful. o) 1 in 20 is 5%. so the number of deaths is no more than 1525. The study likely only used those 1525. John Bignell calls the 30,500 a Trojan Number. o) the percentages listed for each age group sum to 103%. Generous rounding perhaps. Working backwards is a pain but assuming they properly took into account the sizes of each group, the effect they have found is very small: less than 10% * 5% = 0.5% when compared to the arbitrary range of 24-26. This number is almost imperceptible. Using percentages makes it look larger than it is. Not only that, but they only studied men born between 1940-1950. It’s clear from the study though if were born during that time you should avoid having a child when you are less than 22. I guess I’m lucky that I held off until I was 29. This is typical of many findings in the supposedly scientific field that once found important problems (and easily found) but, those having been fixed, is reduced to quibbling over ever smaller and questionable effects — found only by using fallacious p-value reasoning. Time for them to find more rewarding work. Unfortunately, as lamented in Ghostbusters the private sector expects results where apparently academia doesn’t. Are there any studies about men who opt out of having children?